Summon: Gains Drain if there is an enemy creature in this lane. Ravenous Hunger is an epic Willpower creature card. It is part of the Core Set. This card was previously part of the training mechanic where it could be upgraded from Starved Hunger at level 48. This card's summon ability applies the Hungry card effect. 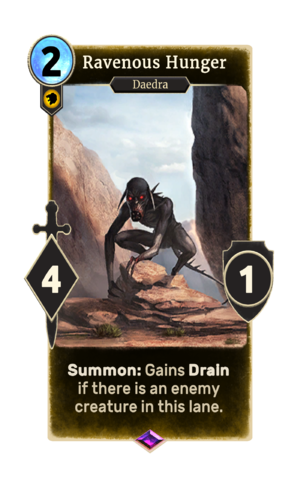 The card depicts and is named for the Daedric Hunger. This page was last modified on 14 February 2019, at 11:50.